Want your student writers to find their voice and figure out their process? Of course! If only it was easy. But there is a simple strategy you can use to let student writers help each other in this process. (Hint, you're definitely going to want to download the freebie at the end of this post). Everyone writes so differently. If only there was a one-size-fits-all approach we could teach, but alas, it seems that writing is a lot like infant sleep. You just have to figure out what works. That said, a little advice never hurt. As writers grow and learn a variety of approaches, they discover their own style. They blend the advice of this teacher and that teacher, this video and that book, this experience and that friend. When you look back over your own writing history, do you notice that your writing style and process is a blend of your writing experiences and other people's advice? I do. 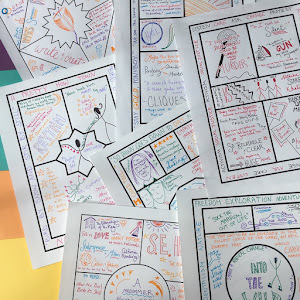 In the very first chapter of her book, Make Writing, Angela Stockman shares a story about a student storyboarding a plot with sticky notes, adding in arrows, scribbled notes, and ideas. Other students gathered to watch and ask her about her process. After watching the students learn from the storyboarder, Stockman began to incorporate an opportunity for students to share their process as well as their results with each other. "This discovery inspired me to leave time for informal exhibition at the end of each session. We still celebrate works in progress and the things that writers create, but the purpose of the exhibition is very different: Here, learners demonstrate writing and making processes, thinking aloud, and giving their learning away" (26). Stockman's idea to have students teach each other about writing got me thinking. How could we incorporate this concept simply into any and every English classroom, whether or not the students were experimenting with the ideas of the maker space? That's when I came up with the idea of the writers' display wall. Let students share their best process ideas in vivid color, and keep them on the wall all year long for their peers to see. 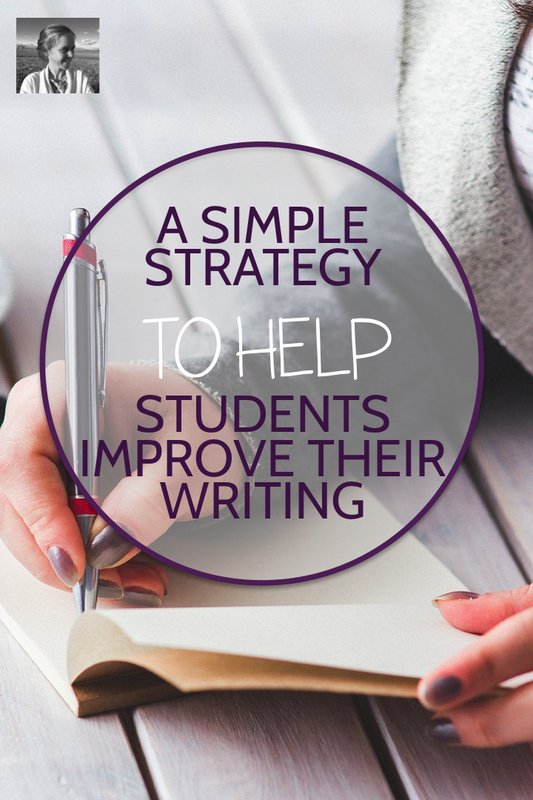 Add the tips of all your classes, and soon students will have a menu of a hundred or so options to choose from when it comes to improving their writing process. Ready to create your wall? The banner, brief instructions, and cards are all included in this downloadable freebie. Simply print and put up the banner, then pass out the assignment and cards to your students. Put out flair pens, sharpies, or colored pencils so their cards will stand out on the wall. Once your students have put up their advice, incorporate opportunities to do process research by looking at the wall. Since everyone probably can't fit in to browse it at the same time, make it a station during a prewriting day, or invite different sides of the room to go up one at a time during a drafting session. Have your students jot down two or three process ideas they'd like to experiment with. You could even have them reflect on what they tried as a postscript to their next writing assignment. Be sure to include your own advice, since you are undoubtedly a writer too. In fact, since you've been writing the longest, consider including several of your own cards sprinkled into the student mix. One of the most memorable pieces of writing advice I ever received, which certainly has influenced me throughout my writing career, was from a professor my freshmen year of college. After giving me (and maybe everyone else in the class?) my first ever C on a paper, he went on a twenty minute rant in which he drew strange hieroglyphics on the board which were apparently a picture of the library and completely lost his cool as he yelled that we all "DO SOME RESEARCH!" But the really memorable part was when he said rough drafts are like a chair. Once you've got your chair built and looking beautiful, he said, it's time to rip it apart and build a boat. Whew. Food for writing thought. 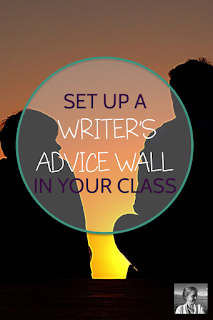 And now it's time for you to take action and go build a writer's advice wall with your students! Remember, everything you need to get going is just a free download away right here. Want more creative, actionable teaching strategies you can use immediately?